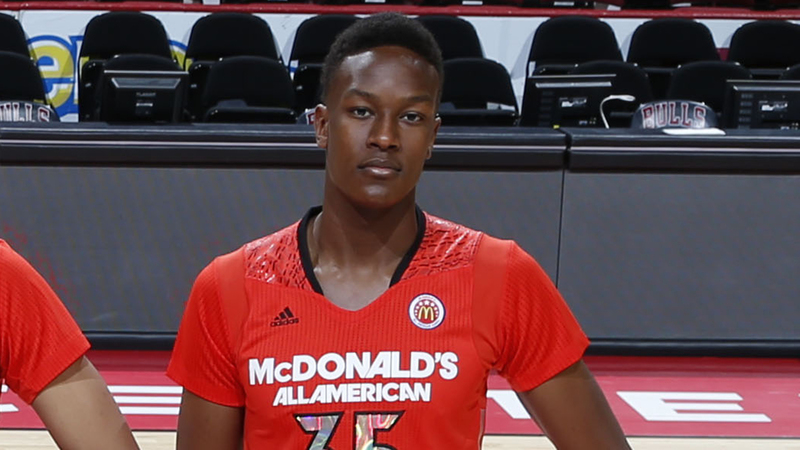 Myles Turner is taking his talents to the University of Texas. Turner announced the decision in front of a packed crowd at Trinity High School in Euless, Texas, where he’s established himself as the nation’s No. 2 player and a McDonald’s All-American. The 7-foot, 240-pound center had been the nation’s top uncommitted recruit and chose the Longhorns over chief competitor Kansas, despite a recent controversy when a student wrote a column for the school newspaper detailing why Turner shouldn’t attend Texas. He took official visits to Ohio State, Duke, Kansas and Oklahoma State. Turner is considered an elite defender but also possesses a strong post game and the ability to hit mid-range jumpers. The Longhorns return every player from last year’s team, which beat Arizona State in its first game of the NCAA Tournament. Texas will pair Turner with fellow five-star recruit Cameron Ridley in the front court. Ridley averaged 11.2 points and 8.2 rebounds as a sophomore this season.